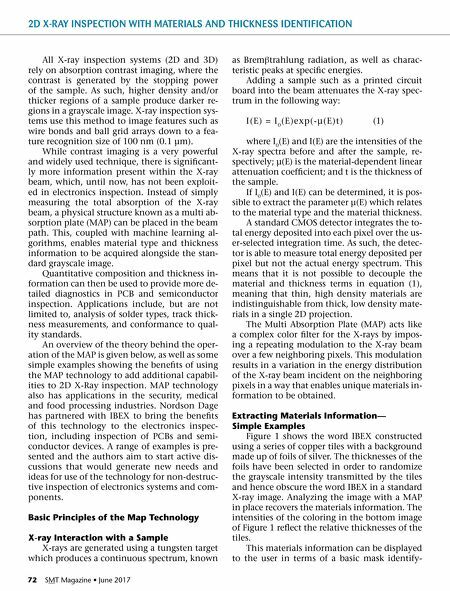 June 2017 • SMT Magazine 73 2D X-RAY INSPECTION WITH MATERIALS AND THICKNESS IDENTIFICATION ing the materials, as an overlay of material iden- tification on the absorption contrast image, or in the case of automated quality inspection sys- tems as a pass/fail criterion. Decisions on material type are made by ref- erence to a materials space plot. The position of a point in this plot gives information on both the material type and thickness. An example is shown in Figure 2 for wedges of aluminum, iron and PMMA. 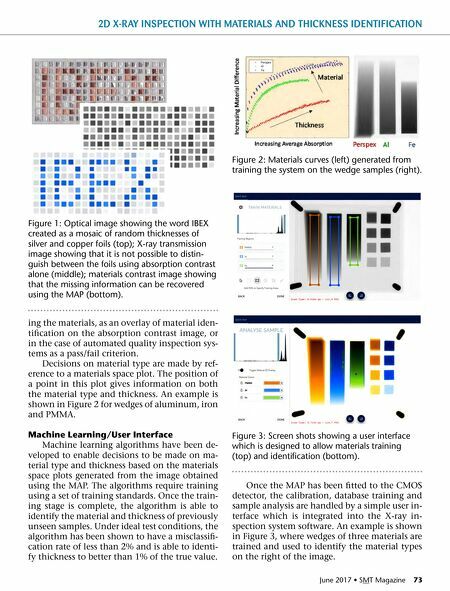 Machine Learning/User Interface Machine learning algorithms have been de- veloped to enable decisions to be made on ma- terial type and thickness based on the materials space plots generated from the image obtained using the MAP. The algorithms require training using a set of training standards. Once the train- ing stage is complete, the algorithm is able to identify the material and thickness of previously unseen samples. Under ideal test conditions, the algorithm has been shown to have a misclassifi- cation rate of less than 2% and is able to identi- fy thickness to better than 1% of the true value. Once the MAP has been fitted to the CMOS detector, the calibration, database training and sample analysis are handled by a simple user in- terface which is integrated into the X-ray in- spection system software. An example is shown in Figure 3, where wedges of three materials are trained and used to identify the material types on the right of the image. Figure 1: Optical image showing the word IBEX created as a mosaic of random thicknesses of silver and copper foils (top); X-ray transmission image showing that it is not possible to distin- guish between the foils using absorption contrast alone (middle); materials contrast image showing that the missing information can be recovered using the MAP (bottom). Figure 2: Materials curves (left) generated from training the system on the wedge samples (right). Figure 3: Screen shots showing a user interface which is designed to allow materials training (top) and identification (bottom).